We all know turkey, mashed potatoes and stuffing are the vehicles for delicious gravy! 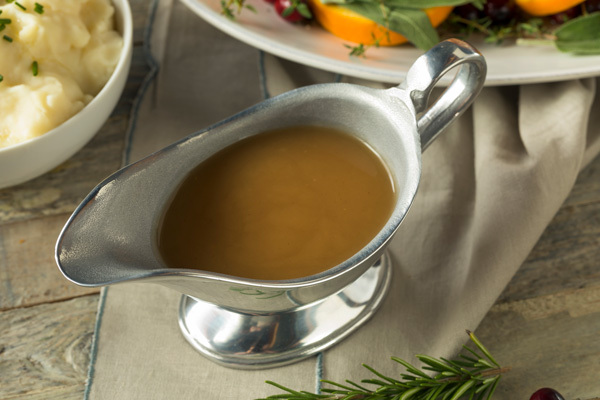 We have two very delicious ways to make your gravy this year. Either one, you will not be disappointed. After your turkey is done add 6 to 8 ice cubes to juices in pan so fat can surface to be skimmed. Make a flour and cornstarch paste (half and half) with cold water. Combine thoroughly. Add to boiling drippings in pan, stirring to thicken. Season to taste. OPTIONAL: When the turkey is half done, heat, DO NOT BOIL, one cup white wine and pour over turkey. This is the secret to a marvelous gravy. Remove turkey from oven to allow to cool slightly. Remove turkey from pan using a turkey lifter. Pour the remaining contents of pan into a fat separator, (we recommend the Souper Strainer from Draeger's HOME Department). Reserve roasting pan for later deglazing. Once fat and cooking juices have separated, pour ½ cup of fat into saucepan. Discard remaining fat while reserving all cooking juices. Heat the ½ cup of fat using moderate flame and whisk in flour. Cook mixture, whisking constantly, for 5 minutes. Whisk in stock and reserved cooking juices. Put reserved roasting pan over a high flame, stir in Madeira, scraping up any browned bits from the pan. Cook for a few minutes. Then whisk in the contents of the saucepan and the demi-glace. Cook gravy 10 minutes stirring often until fairly thick. Stir in giblets and crème fraiche, if using, and cook 5 minutes. Season with salt and pepper.